MADE OF FOOD SAFE BPA FREE PLASTIC: Stainless steel colanders may look modern, but they can get too hot, rusty and ruined. 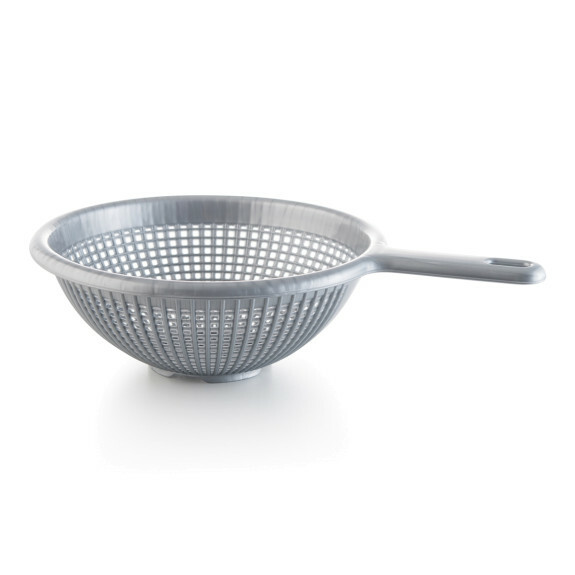 This plastic strainer uses nontoxic materials and is BPA free, with acidic and alkali stain-resistant materials. It will last you years of use without staining or showing signs of wear and tear. Serve your family hearty meals using YBM colanders. Measurements: Upper Length with handle: 12 Inches, Upper Diameter without Handle: 8.5 Inches, Bottom Diameter 4 Inches, Height: 3.5 Inches. This Style is Available in 4 Colors: Gray, Ivory, Red and White. HOW CAN YOU POSSIBLY COOK IF YOU DON'T HAVE AT LEAST ONE YBM HOME ROUND OR SQUARE COLANDER! The Easiest menu For Supper is PASTA of course. Then you just throw some sauce on it and viola you have a gourmet meal. If you don't have a colander or your colander broke, melted or your baby took it as their new toy, it's time for a new one.